Listeners can hear a difference between standard audio and better-than-CD quality, known as high-resolution audio, according to a new study published in the June issue of the Journal of the Audio Engineering Society (JAES) by Dr. Joshua Reiss of the Centre for Digital Music, Queen Mary University of London (QMUL). The meta-study compared data from 18 studies involving 450 participants listening to samples of music in different formats. In total, the studies involved more than 12,000 different trials where participants were asked to discriminate between formats. Overall, listeners could distinguish between the formats, especially if they had been trained to hear a difference. This is the first time that formal meta-analysis techniques have been applied to audio engineering research. “Audio purists and industry should welcome these findings,” said Reiss. “Our study finds high-resolution audio has a small but important advantage in its quality of reproduction over standard audio content. Trained listeners could distinguish between the two formats around 60 percent of the time. “One motivation for this research was that people in the audio community endlessly discuss whether the use of high-resolution formats and equipment really makes a difference. Conventional wisdom states that CD quality should be sufficient to capture everything we hear, yet anecdotes abound where individuals claim that hi-res content sounds crisper, or more intense. And people often cherry-pick their favorite study to support whichever side they’re on. 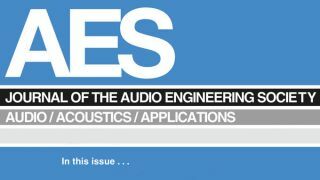 The Journal of the Audio Engineering Society features peer-reviewed papers reporting research in the audio arts and sciences, along with Section and AES event coverage. Full JAES access is a member-benefit. As an Open Access document, Dr. Reiss’ research can be freely downloaded here.